Mezzanine Floor Building Regs | No need for Planning Permission? Do Mezzanine Floors need Building Regulations Approval? Can BSE UK help me obtain Planning Permission for a Mezzanine Floor? As make certain we help our clients every step of the way we can take full responsibility to ensure you receive the correct planning permission for your mezzanine flooring project. What are the 2010 Requirements for Mezzanine Building Regulations? (Source: http://www.planningportal.gov.uk/buildingregulations) Building regulations are in place to promote the health and safety of stakeholders in and around a building by providing standards and requirements for the building design and construction. ‘Raised Storage Areas’ are specifically mentioned in the Building Regulations 2010 thus highlighting mezzanine flooring as potentially susceptible to Building Regulation Approval. Therefore it is important to establish whether or not a mezzanine floor may require approval as part of the design process. Which parts of the Building Regulations apply to Mezzanine Floors? Do you cover off Structural Safety? Part A is covered by the design and load calculations issued by the mezzanine floor supplier. 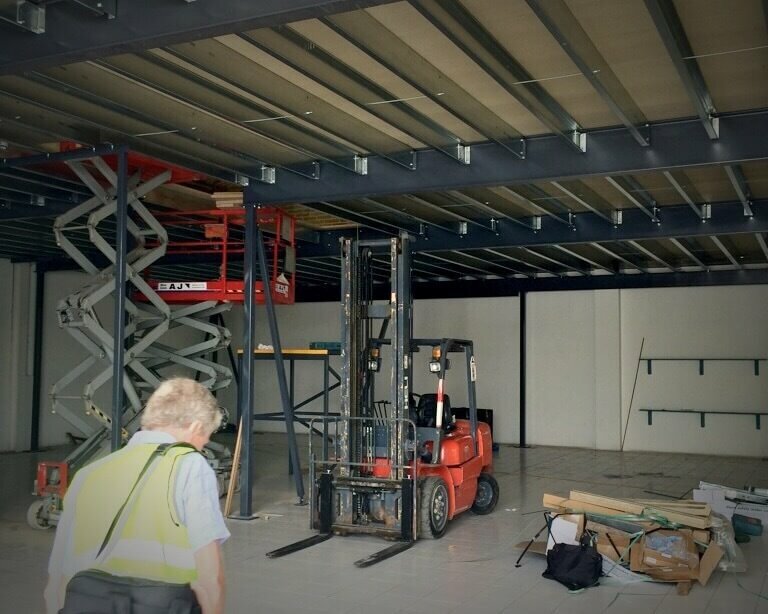 As a trusted UK fitter and installer, BSE UK provides these structural calculations with all mezzanine floor projects, therefore compliance with Part A is a given if you work with our team. 7.7 Raised free-standing floors (sometimes supported by racking) are frequently erected in single storey industrial and storage buildings. Whether the structure is considered as a gallery or is of sufficient size that it is considered as a floor forming an additional storey, the normal provisions for fire resistance of elements of structure may be onerous if applied to the raised storage area. e. the means of escape from the floor meets the relevant provisions in Sections 3, 4 and 5. BSE UK supply mezzanine floors with 1 hour fire protection ensuring you comply with the required standards. What is Part K & Part M Compliance? Do I have to Apply for Building Regulation Approval for a Mezzanine Floor Structure? Yes you can apply for Building Regulations Approval directly with your local council authority or there is an easier way: Get in touch with an approved and independent inspector that can appraise and authorise the installation. For more information on obtaining an improved inspector, check out The Construction Industry Council website An approved inspector will advise on how the Building Regulations apply to the project in order to provide a full understanding of what is necessary to comply. They will also check through the design and the plans of the building and inspect the work as required. Following completion of the mezzanine installation, the inspector will issue a certificate of compliance to the local authority in order to confirm completion of the work to the required standard. At BSE UK we can provide you full Building Regulations Approval as part of the supply and installation of the mezzanine floor. This keeps things simple for you and ensures that your project isn’t delayed by to-ing and fro-ing between individuals, inspectors and authorities. We have access to a number of approved inspectors who we work closely with to provide the full Building Regulations Approval service. Call us today on 01179 555211 to discuss your project and to decide if your mezzanine flooring needs to apply for Building Regulation Approval.